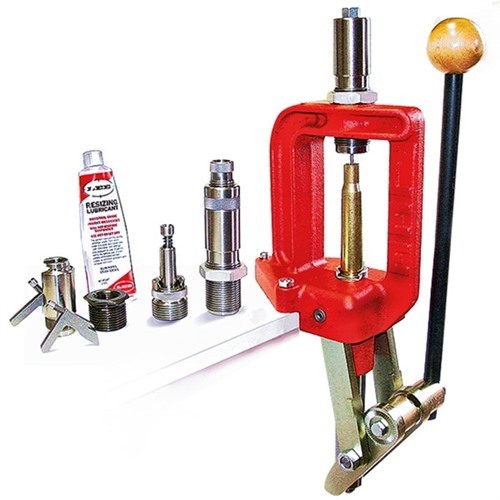 Lee Classic Cast Reloading Kit for 50 BMG. Includes Classic Cast Press that accepts both 7/8x14 and 1 1/4x12 thread dies, 50 BMG 2-die set, Shell Holder, Ram Prime and Case Lube"
Lee Classic støpt omlasting Kit for 50 BMG. Omfatter klassiske Cast trykk som godtar begge 7/8 x 14 og 1 1/4 x 12 tråden dør, 50 BMG 2 brikke satt, Shell Holder, Ram Prime og tilfelle Lube "
This unit works well for loading 50 BMG. I'm just starting out but it was easy to use. I looked over RCBS Ammomaster and Hornady LNL but it was way beyond my pocket. I know I'll upgrade someday but this press is good/cheap way to understand reloading the 50BMG. I use a Barrett single shot to fire the reloaded rounds - doing less than MOA at close to 500 yds. I'm going to buy the Lee factory crimp die next. Lee is OK. Produsentnr. : 90859 734307908591 Lee Classic støpt omlasting Kit for 50 BMG. Omfatter klassiske Cast trykk som godtar begge 7/8 x 14 og 1 1/4 x 12 tråden dør, 50 BMG 2 brikke satt, Shell Holder, Ram Prime og tilfelle Lube "